In this affordable program you will learn a specific online marketing system you can use and follow every day that will allow you to work with ideal clients, enjoy the income you deserve, and be seen as a go-to leader in your field (while having more fun!) No fluff, no “overnight Internet riches” promises–just real-world, solid training that WORKS. You’ve been asking for a way to make more money and get more clients and customers in your business for a long time. You have been spinning your wheels trying to make this whole online marketing thing work for you, and you’re finally ready to give up on trying to go it alone and figure it all out by yourself. Why? Because that way is not working. If you’ve been experiencing any of this at all, know that it’s ok. It’s not your fault, it’s just that you haven’t been given the tools and the systems and the PLAN to get you where you want to go. We’re about to turn that all around. I know. It all seems like a lot. When you’ve got the model, the examples, the templates and the how-to, things become EASY…and getting results become FUN. YOU CAN DO THIS. I truly believe that with all my heart. So what does it REALLY take to have a highly successful and sustainable business online? If you want to reach 6 figures and beyond in your own online business, never worry about a shortage or clients and customers, and enjoy having that elusive “expert status” in your field, you need to do things in a CERTAIN way. I’ve been where you are and I understand just how it feels. Not knowing where to start, feeling totally confused, having invested in other courses and information products that just left me more lost than before. I began with literally nothing-—no business, no list, no clients, no name recognition, no money…and had the same fears, frustrations and doubts that you’re most likely having right now. Not so long ago, I was unhappily working in a job at a company that was struggling financially. I was restless, bored and unfulfilled and wanted to have my own business so badly. Having always had a job, I was unsure how to make the leap and anxious about losing the “security” of a paycheck. When I first dipped my toe into the entrepreneurial waters, I fumbled around trying to figure it all out myself. It was lonely and it WASN’T working. I finally began seeking out mentors. That search led me to several people who each taught me an incredible amount about personal development, business success and marketing. However, it wasn’t until one day when I decided to make a HUGE (and frankly terrifying) financial leap of faith to hire a mentor and coach that things began to turn around. In fact, the universe must have seen I was ready to really play big when I made that decision—as 3 weeks later I was promptly laid off from my job! When that happened I was filled with a mix of emotions—pure terror at first wondering what in the world I was going to do; then nervous excitement because I knew with my coach’s guidance there was no turning back. I was determined (and had no choice really) to learn as much as I could about building a successful and sustainable business online. Why online? Well, I had just recently gotten married and I was dead set on finding a way to make a really good income without the commute, the lack of control and the lack of true financial opportunity associated with most jobs—before we started a family. I knew that when we did decide to have children, I wanted to be home with them, unlike my own working parents who were never able to be home with me growing up. The bottom line was, I HAD to make this work. As I studied under my coach privately for two full years, I soaked up all her experience and knowledge like a sponge. Not only that, but I began implementing like crazy. Although the financial investment was considerable, the shortcuts, accountability and support I was getting was priceless. For the first time in my life, I knew I was going to achieve my long-held dream of having my own business. Around the same time, this thing called social media was absolutely blowing up and I began to feel very drawn to it. I discovered I had a real knack for helping others simplify and implement social media as a marketing strategy. Combining it with the online marketing and entrepreneurial skills I was learning through my coach, I began growing my business by leaps and bounds. People were sitting up and taking notice of this success and were constantly asking me what it was that I was doing. Because I knew I could map out exactly what I was doing and help others achieve the same results I had in much less time, I decided to create a real-world, proven system for consistently bringing in new clients and customers using the Internet. I want to tell you that it doesn’t have to be so hard. Today, I don’t have to struggle–to get clients, to make money, to enjoy life outside my business. It’s an awesome feeling doing something you love, and making really nice money doing it! I’m happy to say it’s also really fun. But my greatest joy is seeing my clients and students knock it out of the park with this information! “I actually almost did not sign up for Get Clients Online because I felt that I did not need to spend more money on another program. Then I talked to Christine and after that conversation I realized that this program was different. Thank you! I have more confidence in myself and my services. I have generated more revenue and re-enrolled one of my clients who was nearing the end of her program. And signed on another new client – solely through a conversation in email. I created two new amazing programs in two days and I raised my prices because I saw that what I was giving was way more than what I was charging. I attribute this to more inner confidence because I now know what I am doing with my business and this course filled in a lot of the empty places. “I was afraid of spending more money and still not learning the ‘how’ part that I needed. I took the chance, and I’m really glad I did. Christine gave me the step-by-step ‘how’ to market my business that I really needed. I’m not afraid of marketing anymore, and that’s a big accomplishment. I was afraid of selling myself because I didn’t want to feel like a smarmy sales person. The Get Clients Online program taught me how to market and still be my authentic self. It has really helped me to get even more clear about my business and that has opened up some new and unexpected opportunities for me already. I’m feeling more excited about my business than I have in months. My website traffic and opt-ins have more than doubled in the three weeks after the course ended. I’ve also got more than double the free breakthrough sessions scheduled for next week than I have had in the last three months. I would highly recommend this program because it works. Christine really takes the ‘scary’ out of marketing and teaches how to market from a place of authenticity and integrity. “Before taking your Get Clients Online program I knew something was desperately needed to rejuvenate my business, but did not know what it was or where to begin. My mind was focused on trying to be like my competition. Now, because your program teaches us to bring out our uniqueness, I see there’s plenty of room in the tent. Today I’m all about being authentic, which is much more powerful. Instead of worrying about my business I am positively focused on my business every day. My newly acquired knowledge is increasing my feelings of self-worth and confidence as a businesswoman. I’m generating more revenue because I never miss the opportunity to upsell my services. Now that I have the tools to market a business online, it’s increasing my value to clients. …and today, I have over 50,000 people in my community and on my email lists with new subscribers signing up every day, I work with fabulous clients, I’ve created and quickly grown a 6-figure online business I can run from anywhere, launched and sold tens of thousands of dollars worth of products, spoken at dozens of business events on how to make an impact with social media and online marketing, was profiled as one of “16 Brilliant Business Minds on Twitter” by The Huffington Post, and have coached and trained hundreds of entrepreneurs from around the world, including France, Australia, New Zealand, England, Qatar and the Philippines. Personally, I learn best when I am given everything step-by-step, which is why I am giving you everything you need in this training course—worksheets, templates, examples, scripts and more. As I always say, why reinvent the wheel? I’ll give you what you need during this intensive program (including going WAY beyond the “what” and the “why” and deep into the exact “HOW”)—all you have to do is take ACTION on what you’ll learn (I’ll be there every step of the way with you). Think about this…what kind of difference would it make in your business and in your LIFE to enjoy consistent $10,000 + months, every month? Or heck, even just bring in an extra $5000 more each month? How would that change not only your life, but the life of your loved ones? Guess what? You can have it. In this system, I will lead you through the strategies, systems and techniques that I still use EVERY DAY to run a freedom-based business that I LOVE. What this means for you is, you get the BEST of me, helping YOU grow your business and get BIG results! It’s my honor to work with you this way! Think of it as boot camp for your business! There is NO other program out there like this, anywhere. Guaranteed. It’s YOUR turn and YOUR time to get the clients and the recognition you deserve. In this transformative, step-by-step training program, you’ll learn all those pieces that have been missing up until now! This program is likely going to be very different than anything you’re used to. Whether you’ve just launched your business or you’ve been at it for years, you are going to be getting everything you need (without any of the stuff you don’t)–a clear, step-by-step plan you can apply and follow in your own business every single day for more clients, customers and cash flow–starting right away. This is a true HANDS-ON PROGRAM–you’ll get to brainstorm and create your marketing, and I will help teach you how you can get more clients and make more money–all while giving you examples for everything. Your tuition, for the Get Clients Online Home Study System is $997. I know. It’s a STEAL. See, the program pays for itself if you simply follow everything I teach you to do. From there the sky’s the limit. I am going to be really BOLD here and tell you that can’t afford NOT investing in YOURSELF and the future of your business. You are investing in your education, and I am going to walk you through the whole entire process. And you don’t want to wait. I know making an investment in yourself can sometimes make you feel nervous, especially if it’s your first time doing it, OR if things haven’t succeeded in the past. Spending money on something that will require you to change can make it even more of a concern. I can tell you from working with dozens and dozens of other entrepreneurs who were once in your shoes that this WILL WORK. My system is proven and as long as you do what I tell you to do and implement consistently, it will work for you. And there’s really no way you WON’T be able to implement because I will be there by your side the whole entire way. Step by step during the whole training. All you’ll need to do is apply it to your own business. This is your time to focus and work closely with me on all aspects of growing your business. Not only will you be getting lots of in-depth training, solid HOW-TO, golden nuggets, and HOT marketing secrets, you’ll also benefit from the open Q&A that took place during each and every training class. for you to refer to after the course ends–time and time again. I’ve created lots of exercises and worksheets to help you work through the content and implement the steps you’ll be learning to get FAST results. These resources will help bring even more clarity to the work we’ll be doing together. I’m sure you’ll be referencing them for a long time after you’ve completed every module of the course. This by itself could sell easily for $1,000 or more. Are you ready to take a STAND for your business and for your dreams? 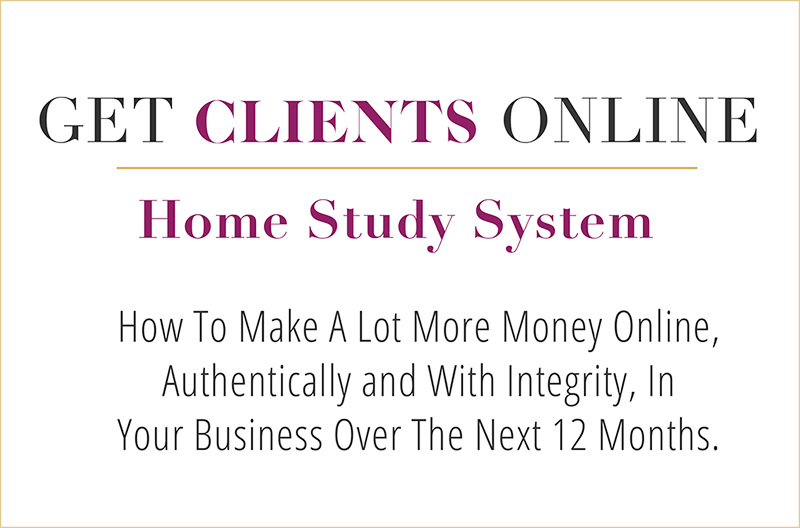 Claim your copy of my Get Clients Online Home Study System now for just $997. So, think about where you are in your business RIGHT now. Are you going to let ANOTHER year go by NOT turning those big dreams you have into reality? Isn’t it finally time to get the PLAN for exactly HOW you are going to take your business to the level? Are you ready for me to lay out, step-by-step, exactly how I regularly enjoy 5-figure months so that you can take the same strategies and tools and do the same thing in your business too? I am so ready to share it all with you, and SO excited to help you celebrate YOUR success too!! P.S. If now isn’t the time for the tide to turn in your business, then when? Do you really want to go on getting lackluster results, doing the same old things and working way too hard? Why settle for that when you could have SO much more? No more excuses…take decisive action right now and register for this business-transforming program. P.P.S. Don’t forget–this program is 100% tax-deductible (just check with you accountant), so you have nothing to lose. Have questions about the Get Clients Online System? Christine has all the answers.